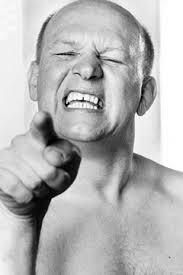 On the 2nd April 1934 the man who went on to thrill millions of wrestling fans throughout the UK was born in Sheffield. Shortly after his birth Glover moved to Barnsley where he grew up and spend most of his adult life. Glovers father, Charlie Glover, was himself a professional wrestler under the name of the Red Devil and it was inevitable that Brian would follow in his footsteps and enter the ring which of course he did. At the start of his career Glover took the ring name of Erik Tanberg from Sweden but he was struggling to make any impact and despite his best efforts did not seem to climb the wrestling ladder. Glover having completed his studies as a student proceeded to become a schoolteacher and supplemented his income by wrestling in the evenings. However, fate was about to take a turn that would catapult Glover into the public eye. One night whilst appearing on a show a wrestler from France by the name of Leon Arras had not arrived leaving the Promoters with a headache. The solution was to put Glover in the match as Leon Arras, tha man from Paris with the promoter saying 'nobody knows what Arras looks like so they wont know its not you'. As a result of this Glover made his debut as Leon Arras and the rest is history. Under a new name and ten years after his debut in the professional ring Arras started to make regular appearances on World of Sports wrestling slot and soon had a cult following throughout the country. Glovers style of wrestling was more comedic than technical and his catchphrases of 'ask him ref' and 'ows about that then' were soon known throughout the wrestling halls. Although he had many bouts with many top stars of the day including Colin Joynson, Pete Roberts, Billy Two Rivers, Arras' most famous match and the one he will always be remembered for was a televised match from Huddersfield on the 25th July 1970 against Les Kellett. This match is fondly remembered as one of the most amusing matches in British wrestling history. 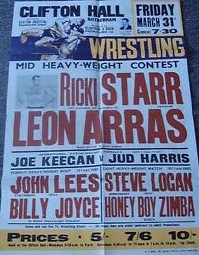 Leon Arras had finally made a name for himself in the wrestling business and was often in demand from Promoters all over the country. However, another calling was on the horizon. Whilst working as a schoolteacher Glover had been approached to play the part of a P E teacher Mr Sugden in the 1966 blockbuster film Kez. Glover received rave reviews for his acting skills and although he had continued to wrestle since his appearance he suddenly found himself in demand not just for wrestling bouts but for television and film work. Glovers acting work was increasing and he appeared as a regular in the television series Porridge and Doctor Who and for the Royal Shakespeare Company in plays such as Romeo and Juliet and As You Lie It. Glover for many years was also the voiceover for Tetley tea. With acting work now Glovers mainstay he retired from the ring much to the disappointment of his fans, his catchphrases were never to be heard again and his ring style was never to be seen again. 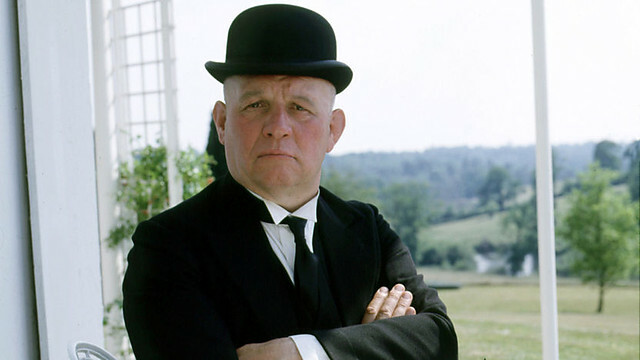 Glover went on to have a very successful career as an actor but contracted a brain tumour and sadly passed away on the 24th July 1997 at the age of 63. Glover will never be forgotten amongst the wrestling fraternity and his contributions to the sport warrants his entry into the Hall of Fame.